There are many Lasallians who have heard groups of Brothers or others sing the “Honneur a Toi” – a song composed for John Baptist de La Salle’s beatification in 1888, very probably by a “Brother Idelphus” who most likely also wrote the tune. Others have said that the tune was an old French bar-tune, but it’s probably best to retain a more pious provenance. One president of a Lasallian school calls this “the Brothers’ fight song” and I suppose that it’s partially true, since U.S. Brothers gathered for some feast, liturgy, or dinner will often sing this at some point in the celebration, and with great gusto. (The French Brothers eschew the song with slight embarrassment, largely because of the piety of the words.) Uploaded to the LRC website are a variety of musical settings or accompaniments of the song, from Paul Manz (a distinguished Lutheran organist and composer) to Deke Sharon (a top contemporary choral composer). These, along with more traditional organ and piano accompaniments, will enable school groups and others to join into the “fight song” and honor De La Salle on various occasions that may be appropriate. 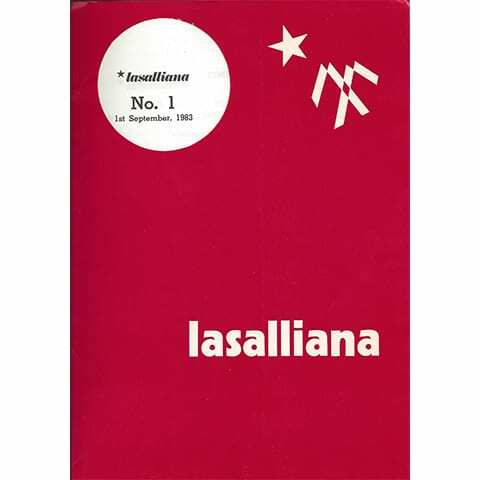 The other major resources that are being uploaded are high-definition, OCR enabled PDF scans of a series of reflections on Lasallian topics called “Lasalliana” that were published out of Rome between 1983 and 2001. Over a thousand 2-page leaflets were produced and shared around the world in each of the Institute’s official languages (French, Spanish, English). Along with these first volumes, the “INDEX” of all the articles has been made available immediately. Although it is Volume 51, you will appreciate the value of seeing the vast breadth of scholarship represented within this series. This volume, like all of them, is a searchable PDF, allowing visitors to find specific topics, names, and themes simply by searching the index online. These short articles represent an amazing set of scholars, Brothers, Partners, leaders, writers, and others who share the fruit of the research work and ministerial experiences in compact, focused, high-quality short pieces of writing. Since there are over 50 volumes, they will be uploaded over the next several months, and in this space I will highlight some samples of what these volumes contain. It will be well worth your while to simply glance through each volume (by looking at the “INDIVIDUAL ARTICLES” tab on each volume’s main page) and choose those topics or writers that strike your interest. By doing so, you will be educating yourself about the Lasallian world via some of the best educators who have been part of our Lasallian heritage, and a few of whom are still around. In Volume 1 there are articles by Br. Maurice Hermans, one of the founders of Lasallian Studies in Rome in the late 1950’s, Br. Luke Salm, who became so pivotal as the lead teacher in the Buttimer Institute, and Br. Francis Huether, after whom the Huether Institute is named. Volume 2 includes an “X-Ray” of De La Salle’s life by Br. Saturnino Gallego, a major biographer of DLS for the Spanish world, along with the first of many entries by Br. Leon Lauraire (who also served as Lasalliana‘s editor for many years). His topic and passion is the Lasallian classic text, The Conduct of Schools (AKA The Management of Schools). Simply following Br. Leon’s Lasalliana articles on this pivotal text throughout the subsequent years of Lasalliana articles, which he later expanded into four volumes of the scholarly Cahier Lasaliens series, would serve as a great independent study course. The article in this volume is the first of his writings on the topic. Volume 3 continues the series begun by Br. Leon and others in earlier volumes and includes other interesting topics like who the “clientele” of the first schools were, and how that very first community in Rheims was founded, along with what was happening with Lasallian ministries in Africa, Canada, South America, Turkey etc. in the mid-1980’s. There is also the very first article (in 1983!) on the Lasallian Family, written by a lay Partner. My plan is to publish three Volumes of Lasalliana per week over the next 17 weeks and thereby have the entire series available within five months. Other resources will also be simultaneously uploaded. I’m exploring means of enabling site visitors to search just these Lasalliana resources for keywords, etc., so that a specific search within just Lasalliana articles becomes possible. Progress will be reported in future updates. Meanwhile, if you have suggestions of resources to upload and include on the website, please email me and let me know. Nothing to say here but bravo!